News of a merger or acquisition is a big event in the life of a company, which stirs uncertainty, anxiety and fear. The changes, redundancies and so on, that often follow this news, are a further source of turmoil for the employees of both companies involved. There is no magic formula to avoid these effects completely. However, good planning, communication and human resource practice can mitigate the worst of them; keep everyone that matters on board; and ensure that the new organization maintains your reputation for sensitive people management. Get it wrong, on the other hand, and you may lose the very people you were most anxious to keep; put the success of the process at risk and even face employment tribunals or other legal proceedings. In addition, imagine how these processes are complicated by any transnational elements. 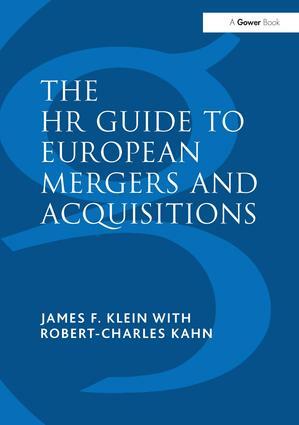 James F. Klein and Robert-Charles Kahn provide a practical, hands-on guide to successfully integrating HR functions following any merger or acquisition within Europe. The book guides you step by step, providing the methodology, tools, sequence of events and necessary material. It includes comparative tables, tips and stories illustrating the differences, specific issues and pitfalls that are particular to the different European countries. 20 years of human resources experience across companies in continental Europe has gone into creating this blueprint to successfully implementing the people side of successful mergers and acquisitions. Contents: Foreword. Part I The Early Stages: Understanding the objectives, scope and expectations following a merger; HR due diligence; Setting up an integration plan. Part II The Transition Period: Analysis and comparison of terms of employment; Analysis and comparison of benefits; Human Resource Management Information Systems tools and data transfer action plan; Comparison of general policies and handbooks; Designing retention programmes. Part III The Integration Stage: Process review; Manpower planning, assessments and redundancies; Assessment programmes; Redundancy strategy and guidelines; Finalizing transfers and integration; Conclusion; Appendices; Index. James F. Klein is an autodidactic, and has breadth of industry experience in both consulting, banking and FMCG industries - both in Switzerland and in Europe. James is fluent in French, English and German. He has recently moved back to his native Geneva (Switzerland) with his wife and two children. He has also lived or worked in several European capitals as well as in the USA. His professional career has taken him to leading companies such as KPMG, Carré Orban, The European Development Bank, Swatch, Jobline International/TMP, and most recently Polo Ralph Lauren. An intuitive human resources professional he is a strategic thinker who has managed major reorganizations, day-to-day HR, corporate restructuring and a number of wide-ranging M&A projects. Excelling in process and execution, he combines a Cartesian approach to problem solving with both consulting and hands on experience in international human resources management. Robert-Charles Kahn graduated with a Master's degree from 'Thunderbird', The American Graduate School of International Management in Phoenix, Arizona (USA). He obtained his bachelor's degree from Macalester College in St. Paul, Minnesota (USA) where he is a native. Robert is fluent in English, Spanish, French, and German. He resides in Geneva with his wife and two children and has lived and worked in numerous countries in Europe for the past 17 years. He has worked for many blue chip companies such as Price Waterhouse, Citibank, Medtronic, Westdeutsche Landesbank, Alusuisse-Lonza (Lawson Mardon Packaging), Givaudan, and Jobline International/TMP. Kahn is the founder of the consulting company RC Komm SA where recent projects have helped clients manage their marketing, public relations, training and communications challenges taking them to the next level of overall growth, distinctive positioning and unique awareness. As a consultant and team player consistently adding value to process, Robert works together with companies helping them stretch themselves crossing borders in their communication, training, public relations and marketing challenges. He successfully combines his culturally sensitive Americanism and positive 'can-do' energetic mentality with respect and value for traditional European structures.